Japanese manufacturer Scythe, comes up with new convenient solution which can handle all of your memory cards form smartphone to your digital camera. 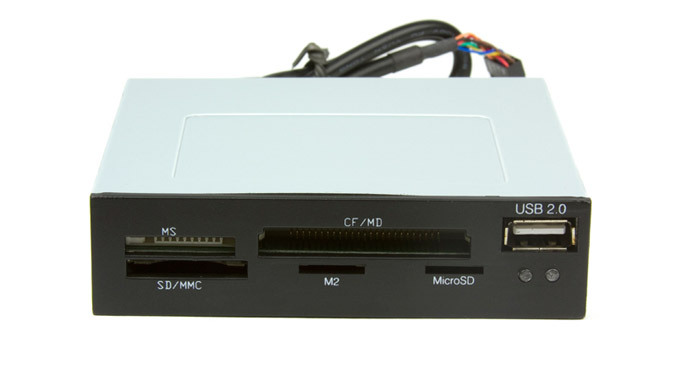 Called Kama Reader Jr, the compact multi-format card reader can be installed into a 8.89 cm (3.5 inch) drive bay on your desktop machine and is compatible with virtually any memory card on the market. Kama Reader Jr is also equipped with a front USB port, to for easy connection of your thumb drives and is now available for 7,50 € . Memory Stick (PRO, ROM), Memory Stick (DUO, PRO-ROM), Compact Flash, Micro Drive, SD Card, SDHC Card, Mini SD + Mini SDHC (requires adapter), MultiMedia Card (MMC), RS-MMC (requires adapter), MMC Micro (requires adapter), Memory Stick Micro, Micro SD, Micro SDHC.